Fantasy baseball pitching report: Corey Kluber, Max Scherzer and Shelby Miller all prove their fantasy worth with strong outings last week. It’s a well-established fact that pitchers are more unpredictable than hitters, largely because of just how easy it is for pitchers to get injured. That’s why many fantasy owners invest in hitters early, preferring to target the glut of worthy middle-round pitchers to fill out their rotations. It’s an intuitive, sound strategy that we advocated here back in draft season. Now that we’re about one-quarter of the way through the season, we can take stock of player performance without sounding the small sample size alarms. Of the top-20 starting pitchers in standard 5x5 head-to-head leagues (standard meaning using wins, strikeouts, saves, ERA and WHIP as pitching categories), seven—Max Scherzer (ranked second, third in ADP), Zack Greinke (third, 10th), Felix Hernandez (fourth, second), Sonny Gray (fifth, 20th), Matt Harvey (seventh, 14th), Johnny Cueto (ninth, ninth) and Gerrit Cole (11th, 19th)—were in the top 20 in average draft position by the end of draft season. Some notable omissions include Clayton Kershaw, Chris Sale, Stephen Strasburg, Madison Bumgarner and David Price, all of whom were one of the first 10 pitchers off the board in a typical draft. Who is among the top 20? Shelby Miller is currently the top fantasy starter, with a 1.43 ERA, 0.83 WHIP, five wins and 43 strikeouts in 54 innings. Dallas Keuchel, Chris Archer, Aaron Harang and Chris Young are all in the top 10. Jake Odorizzi, A.J. Burnett, Michael Pineda, Michael Wacha, Bartolo Colon, Ubaldo Jimenez and Garrett Richards are among the pitchers ranked 11th through 20th. Those were all pitchers who came off the board in the middle or late rounds. Therein lies another reason why it makes sense to wait before diving into the volatile pitching pool. It would follow that if expensive pitchers are risky investments because of how regularly they go bust, inexpensive pitchers are smart investments because they fill the void left when their high-priced counterparts fall short of expectations. No one is suggesting that Keuchel or Archer or Odorizzi or Colon will be a better fantasy pitcher than Kershaw or Bumgarner or Sale for the rest of the season. The point, however, is that yet again pitching is proving itself once again to be the easier part of a fantasy roster to fill and find bargains. Where does Kluber's 18-strikeout game rank among best all-time? It took six weeks, but Kluber finally got the results expected of a defending Cy Young winner. He shut down the previously hot-hitting Cardinals, tossing eight scoreless innings and whiffing 18 batters in eight innings. Kluber had a no-hitter through 6 2/3 innings, but lost it on a clean single up the middle by Jhonny Peralta. He could have had a chance to break the nine-inning strikeout record of 20 shared by Kerry Wood and Roger Clemens, but Terry Francona lifted him from the game after eight innings and 113 pitches. Either way, it was the most dominant individual pitching performance of the season to date. Despite some uneven outings earlier in the year, Kluber still has a 2.64 xFIP, 1.20 WHIP and 64 strikeouts against 11 non-intentional walks in 52 2/3 innings. The numbers may not reflect it right now, but he’s still a top-five fantasy starting pitcher. He’ll take the ball twice this week, facing the White Sox on Monday and Reds on Saturday. No one doubted that the Nationals added one of the best pitchers in the majors when they signed Scherzer, but plenty wondered aloud whether it made sense for a team with an already elite rotation to pour even more resources into its greatest strength. 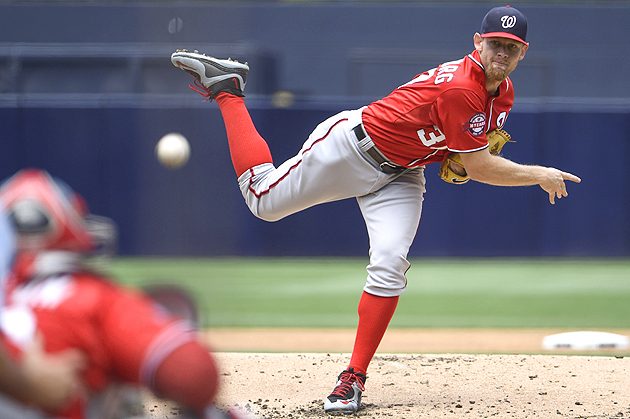 Given the way Stephen Strasburg and Jordan Zimmermann have pitched this season (though Zimmermann is coming around), the Nats are likely happy they did. Scherzer had two more great starts last week, earning wins over the Diamondbacks and Padres. He went seven innings in both starts, allowing a total of one earned run on nine hits and three walks, while striking out 17 batters. He fanned 11 Padres over the weekend, and has had double-digit strikeouts in three of his last four outings. As expected, he’s among the league leaders in every meaningful strikeout statistic, ranking ninth in K/9 (10.48), fourth in strikeout rate (29.5%) and first in raw strikeouts (66, tied with Clayton Kershaw). His next start is Saturday against the Phillies. As close as Kluber was to a no-hitter against the Cardinals last week, this former Cardinal took his own no-hit bid right to the brink before losing it. Still, it’s hard to imagine Miller’s owners, or the Braves, for that matter, complaining too much after the week he just turned in. Miller didn’t allow a hit against the Marlins for 8 2/3 innings before losing it on a single by Justin Bour. He had to settle for a two-hit shutout just six days after he held the Reds to one run on three hits in seven innings. It takes years to evaluate trades, but the early returns in the Miller for Jason Heyward deal certainly favor the Braves. Last week in our series on scouting pitchers, we noted how Miller’s cutter has made him an altogether different pitcher this season. He threw the pitch 35 times in his two outings last week, 27 of which were strikes. When it proved to be the final pitch in an at-bat, hitters went 2-for-9 with a pair of strikeouts. He’ll next take the mound Saturday against the Brewers. ​Leake’s first start of the week wasn’t actually terrible, though it wasn’t all that good, either. He danced around eight hits and two walks across six innings, allowing one run while striking out just one batter. He wasn’t able to pull off that jig a second time, as the 12 baserunners he allowed in a start against the Giants on Saturday resulted in nine earned runs in five innings. Before that start, Leake had allowed a total of 13 runs in 49 2/3 innings this season. Brandon Crawford’s grand slam in the fifth inning put a capper on the Giants’ outburst, as well as Leake’s start. Despite the terrible outing, he still has a 3.62 ERA, 3.99 xFIP and 1.10 WHIP this season. His strikeout rate is way down, and that limits his fantasy value, but he’s plenty relevant in deeper mixed leagues. His next start is Friday against the Indians. Kennedy didn’t exactly get shelled in either start last week. He simply had two outings of the everyday bad variety. He allowed five runs on eight hits and three walks in 4 2/3 innings on Tuesday in a loss to the Mariners. He then took the ball against the Nationals on Sunday, and actually appeared early on to be on his way to a redeemer. Through four innings, Kennedy had six strikeouts and didn’t allow a hit, with Washington’s only baserunner coming via a walk by Bryce Harper. The Nationals touched him up for three runs in the fifth on a homer by Danny Espinosa, then got him for three more in the sixth after he walked the bases loaded to start the inning. All told, he surrendered six runs on three hits and four walks in five frames. The 11 strikeouts may have softened the blow for his fantasy owners just a little, but it’s hard to look past the ugly rates he contributed last week. In 29 1/3 innings this year, he has an ugly 6.75 ERA, 1.47 WHIP and 9.4% walk rate. He takes the mound at Dodger Stadium on Saturday, an outing in which many fantasy owners may want to keep him affixed to the bench. Fister had one of the worst starts of his career last week, surrendering seven earned runs on eight hits and walk to the Padres in just two innings. Days later, it was revealed that he had a flexor strain in his right forearm, sending him to the 15-day DL. The Nationals do not have a timetable for his return, but it’s safe to say he won’t be able to come back in the minimum 15 days. Fister’s velocity had been down for most of the season, and that deficiency was on full display against the Padres. Fister has never been a pitcher who relies on an overpowering fastball, but it was still alarming to see his sinker checking in at just 87.7 mph in the loss to San Diego. Fantasy owners should keep Fister stashed on the DL for the time being, but it could very well be a long time before he’s back on the mound. I promise not to write about the entire Washington rotation in this column (sorry, Gio Gonzalez). After yet another outing in which he failed to get through six innings, there simply has to be a buying opportunity on Strasburg. It’s important to note that if you pursue him, you need to go in understanding that the pitcher we’ve seen for the first six weeks of the season is at least partially what you need to expect on your team for the rest of the year. It would be foolish to think that he’ll immediately turn back into the Cy Young candidate many thought he would be heading into 2015. The fact remains, however, that the velocity and movement on all his pitches are right in line with where they were last season. He’s still getting more than a strikeout per inning, and he isn’t walking too many batters or allowing very many home runs. He may have a 5.98 ERA, but his FIP is 3.47 and his xFIP is 3.67. The bottom line here is that Strasburg’s command has been terrible this season. We discussed this in a piece on him in our scouting pitchers series a few weeks ago. His command hasn’t gotten any better since then, and that has led to a ridiculous .389 BABIP. Even pitchers with Strasburg’s stuff get knocked around when they’re throwing too many hittable pitches. Still, I’m willing to bet he gets it together, especially if I can make that bet at a reduced price in the trade market. ​Wacha satisfies the first requirement for a sell pitcher. He’s going to be attractive if you put him on the market. A big part of what made Wacha so good in 2013 and intriguing for 2014 was his high strikeout rate. Wacha fanned 65 batters in 64 2/3 innings in 2013, then had 83 strikeouts in 90 1/3 innings before getting injured last season. Since his return last September, he has 37 strikeouts in 60 1/3 frames. Now, he admittedly has gotten great results, posting a 2.06 ERA and 1.08 WHIP this season. He’ll need to sustain rates like that to keep his fantasy value this high if the strikeouts aren’t a part of his game anymore, and it’s hard for any pitcher to do that. What makes that even more challenging is the fact that Wacha is the beneficiary of a .241 BABIP and 84.8% strand rate. Wacha’s not going to suddenly blow up and be a league-average pitcher, but the chances of him continuing to perform like a top-20 fantasy starter with so few strikeouts is nearly as unlikely. Sell out now while the price is high. Given that Burnett is the No. 15-ranked fantasy starter in standard 5x5 head-to-head leagues through the first six weeks of the season, it would be understandable if his owners were looking to sell him at a high price. As we always say here, your door should always be open to potential trade partners. I would caution against assuming that Burnett cannot keep his performance at this level, however. The 38-year-old Burnett is a survivor who has regularly figured out how to adapt his game to find success while his natural stuff diminishes as he gets older. Burnett is throwing his sinker more often than ever this year, offering it more than 55% of the time. It hasn’t been tremendously effective, at least in terms of the results when it’s put in play, but what it has done is made him not at all reliant on a four-seam fastball that just isn’t a strong pitch anymore. His curveball remains among the best in the game, and hitters have just a .162 batting average and .227 slugging percentage against the pitch. So long as Burnett can keep from getting beat up on his sinker, he can be a top-20 starter for the rest of the year. This could be the high point of his value, and you should be willing to discuss his name in trades. Do not, however, sell for anything less than market value. He’s for real this season. Allow me to stretch the definition of the word “prospect” so we can talk about a player who could very well be universally owned in fantasy leagues within the next few weeks. Neftali Feliz has struggled as the Rangers’ closer this year, posting a 5.51 ERA and 1.71 WHIP in 16 1/3 innings. Feliz has a 9.1% walk rate and has surrendered two homers and 21 total hits, both of which are just too many when you’re coming in to protect leads. Texas manager Jeff Bannister said over the weekend that there are no concrete roles in the bullpen at the moment, and that means someone could soon swoop in and steal the ninth inning from Feliz. If someone does so, chances are it would be the 22-year-old Kela. Truth be told, Kela, too, has had his ups and downs this year. While he has 15 strikeouts in 17 2/3 innings, he also has seven walks and a 1.47 WHIP. He has mostly been able to get out of any trouble he has fallen into, but he wouldn’t exactly be a slam dunk choice as the team’s closer, based on his performance to date this season. Having said that, it’s easy to understand why Kela profiles as a closer. His four-seam fastball sits in the mid-to-high-90s, averaging 95.9 mph this year. He also features a curveball and changeup as swing-and-miss pitches. His curve has a whiff rate of 25.2% this season, while the change comes in at a 19.6% whiff rate. Last year between High-A Myrtle Beach and Double-A Frisco, Kela struck out 68 batters in just 49 innings at the ripe old age of 21. The Rangers aren’t going anywhere this season, and chances are Feliz won’t even be on the team when they’re once again relevant. It wouldn’t be a surprise if the team wanted to see if Kela could handle the pressures of closing games. Those of you with some roster flexibility may want to stash him now. He could be the closer in Texas before long. Jake Arrieta just missed out on being one of the pitchers of the week after amassing a 1.20 ERA, 0.73 WHIP and 17 strikeouts in 15 innings. Seven of those strikeouts came against the Pirates on Sunday, and one of those was on this filthy curveball to Andrew McCutchen.